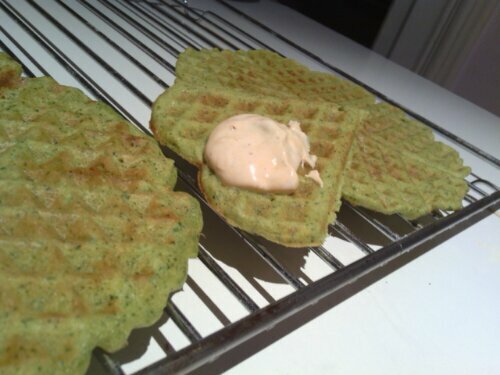 We got some watercress from Riverford this week, and also a new waffle maker – so I decided to make some savoury, watercress based waffles for dinner. They turned out really nice, especially when served with harissa sauce (Greek yoghurt with a teaspoon of harissa, and seasoned with salt and pepper). The polenta gives them a nice, crunchy texture. Thoroughly blend the first five ingredients in a blender and season with the paprika and salt and pepper. Mix the remaining ingredients in a bowl, the stir in the contents of the blender. Keep stirring while adding water until you achieve a slightly runny consistency. The batter then needs to rest for about 10-15 minutes for the polenta to soak – it will become thicker during this time so make sure you have added enough water. Bake in a waffle maker on medium heat and serve hot. Yes, it’s definitely savoury. We had it together with smoked trout as main course.